The most anticipated Blu-ray release of the year shipped a few weeks ago—Universal’s Alfred Hitchcock Masterpiece Collection. I’ve gone through the individual titles to give an extensive review. Now depending on whether you go for the US or the UK release, the set comes with 15 or 14 titles. The US edition includes a reissue of the Warner Brother’s 50th Anniversary Blu-ray release of NORTH BY NORTHWEST. So if you already have that, you might want to consider the UK Limited edition which comes in a rather nice keepsake coffee table book, which includes a number of other extras – like reproductions of costume sketches, posters art, storyboards, production correspondence and more. It definitely makes for a nice package. Other than the inclusion of NORTH BY NORTHWEST, disc-wise, the releases are identical…which means thirteen Hitchcock titles that are brand new to Blu-ray with this release. (PSYCHO had been the only Universal title released thus far) Now there’s some great news and some really awful news about this release. 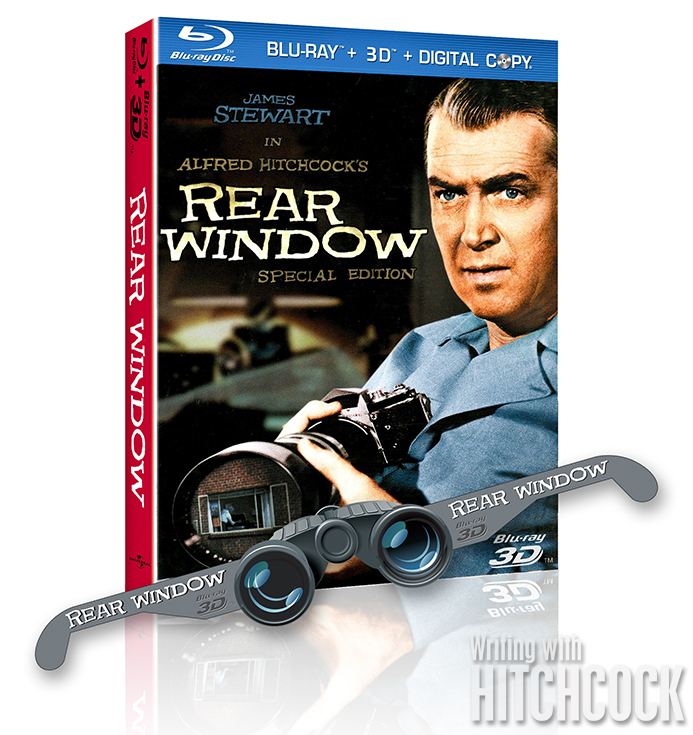 The best news first: REAR WINDOW and VERTIGO will definitely impress. 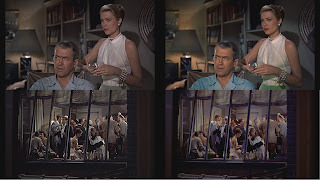 The first thing you will notice about the presentation of REAR WINDOW is the amount of detail you’ve never seen in previous video releases. Both inside Jefferies’ apartment and outside in the courtyard, there’s much to take in. The colors are rich…nice blacks in the night scenes…and fairly accurate skin tones throughout. This is a title that never quite looked as good as it should have, even on the 2008 double DVD release…and it gets the treatment it deserves here. The huge sigh of relief over VERTIGO had little to do with the image quality and more to do with the sound. Many of you know I’ve been pretty outspoken about the botched job that Robert Harris and James Katz did on the 1996 “restoration” of VERTIGO which replaced Hitchcock’s carefully designed and mixed soundtrack with a completely unsubtle, in-your-face, mash-up of foley effects, out of sync music cues and drowned out dialogue. Happily, Universal has NOT included that abomination here. VERTIGO sounds like VERTIGO again! Visually, again, like REAR WINDOW…detail and color are impressive. It’s Hitchcock’s most beautifully shot and designed film and for those times you can’t make it to the Museum of the Moving Image to catch a vintage 1958 IB Technicolor print, this Blu-ray makes a fine substitute. Now just for these two titles alone, in the condition that they’re in, the Hitchcock Masterpiece Collection is worth the price of admission. But let’s take in the rest of the collection in chronological order. SABOTEUR has its problems, mostly having to do with its weak script and weaker cast, and so it generally is ranked to minor-Hitchcock. The one knock-out scene for which the film will always be remembered is the Statue of Liberty sequence, which is still a model for cinematic suspense. As for the Blu-ray, it is absolutely gorgeous to look at. SHADOW OF A DOUBT is surely one of Hitchcock richest and at the same time deeply disturbing works. Often cited as being among Hitchcock’s personal favorites, here on Blu-ray it’s given a presentation worthy of the film. This was Hitchcock’s second film for Universal, and his second with Director of Photography Joseph Valentine. Unlike the almost B-picture look of SABOTEUR, the transfer here shows off Valentine’s carefully textured and lit scenes. The next item in the collection is ROPE, which was Hitchcock’s first venture into color and as it happened, his last film with Joseph Valentine. While it’s not a gorgeous transfer by any means, it’s the most satisfying presentation of the film on video to date. The main problems with ROPE on Blu-ray are in the flesh tones, which are often under saturated. REAR WINDOW, yet again, can’t say enough good things about it…it’s arguably the highpoint of the collection. THE TROUBLE WITH HARRY is another stunning addition on Blu-ray. Hitchcock and Bob Burks’ second VistaVision film together— they had just completed TO CATCH A THIEF when they set out to capture the Vermont countryside in the glory of its autumn colors—and the warmth and the vivid colors are done justice in this transfer. For a film that generally lacks the visual panache of many of Hitchcock’s other films of the period, Harry certainly benefits, and of course, HARRY marks Hitchcock’s first collaboration with Bernard Herrmann. The sound on this and pretty much all titles in the collection is spot on. The next film in the collection, THE MAN WHO KNEW TOO MUCH is certainly one that deserved the kind of treatment given to say REAR WINDOW or VERTIGO. They share the same leading man in James Stewart, it’s another globetrotting adventure in VistaVision, with location filming in Marrakesh and London, it contains one of Hitchcock signature set pieces—the assassination at the Royal Albert Hall—but sadly, the color as presented here is all over the map…even within individual shots. You can literally see Doris Day’s dress change colors before your eyes. There’s frequently a fluctuation in the colors that is visible on the print that was used for the transfer. This is a title definitely in need of some TLC and a whole new transfer. VERTIGO, the next in the collection has already been praised. PSYCHO is the one Universal title that had already been released on Blu-ray previously, and the transfer here is pretty damn good. The image is sharp, there are a lot of fine details to take in. It’s a great way to show off just why the film had the impact it did in 1960. Unfortunately, THE BIRDS is a bit of an uneven mess. Yes, there are sequences that look great… the colors and the details are enhanced nicely on Blu-ray. But given the amount of special effects shots in the film, a good number of them have not translated well to high definition. Next to THE MAN WHO KNEW TOO MUCH, MARNIE is perhaps the biggest disappointment in the collection. The graininess and noise are just out of control in this one. This is another title that is in serious need of a new and improved transfer. TORN CURTAIN was never one of Hitchcock’s more visually pleasing films. I always felt that it looked quite flat and studio bound. The transfer to Blu-ray captures the essence of the film quite well. It’s a mildly entertaining but minor Hitchcock disappointment, due in part to two terribly miscast stars and one very mediocre script. The look of TOPAZ always appeared a welcome relief to me after TORN CURTAIN. On TOPAZ Hitchcock opted for much more location shooting and the result was a richer looking film. Like its predecessor, TOPAZ suffers from casting and script issues, but on Blu-ray you are better able to appreciate the look of the film. FRENZY should have looked much better than it does on Blu-ray. Yet, thankfully, the pre-release issues with the re-done titles that introduced typographical errors have been corrected, and the colors are vividly presented. It’s arguably Hitchcock’s last great film and sadly, it doesn’t look as well as it should. Now, without question the absolute worst looking transfer in the collection is probably the one that shouldn’t have been, considering it’s the youngest film of the bunch. Simply put, FAMILY PLOT has never looked worse. The film always suffered from that bad 1970s TV look. Like it was a CHARLIE’S ANGELS or ROCKFORD FILES episode. There’s no getting around the look of the era here, but the horrible job on the rear projection in the car sequences is just horrendous to look at. The halos that were always bothersome on DVD have been magnified tenfold on this one. It just may be worth holding onto your DVD for the time being, because the Blu-ray is just embarrassingly bad. Now with all that said, do I welcome the addition of 13 Hitchcock titles to Blu-ray? Certainly. For the most part, SHADOW OF A DOUBT, REAR WINDOW, THE TROUBLE WITH HARRY and VERTIGO look absolutely amazing. So it’s worth getting , but do definitely shop around for the best price. In this case, the UK edition, which is completely compatible in the US, is the better buy. This weekend, New Yorkers have a rare opportunity to see Vertigo the way Alfred Hitchcock intended—in 35mm IB Technicolor, with its original soundtrack. The Museum of the Moving Image in Astoria will be screening a print from the film's 1958 first run, just as they had done in the summer of 1996, a few months prior to the premiere of the much-heraleded and much-hyped "restoration" by Robert Harris and James Katz which deservedly caused a stir because of their decision to scrap Hitchcock's original sound mix and create all-new sound effects tracks so that they could incorporate the stereo tracks of Bernard Herrmann's score that had been uncovered during their search for original production elements to assist in their restoration. They dodged, and danced, and put on a bit of a dog and pony show, in defense of their decision, but in spite of the fact that the decison may still haunt them, Universal never fully came down on the side of definitively righting the wrong by Harris and Katz by making certain that all future video releases include at least the option of selecting Hitchcock's original sound mix. Is the difference that apparent you ask? A Very Different "Slice of Cake"
"Some films are slices of life, mine are slices of cake," said Alfred Hitchcock to the French critic-turned-director François Truffaut. What Hitchcock meant was that in his view, he was an entertainer - he could still tell stories of significance, but his objective was never to be dull or "downbeat." 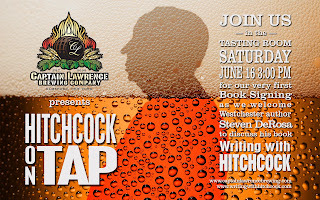 Hitchcock occasionally set aside commercial considerations to reveal a more personal side of his art. Such was the case with his 1958 masterpiece Vertigo, which in a new 70mm presentation was a featured attraction of the 34th New York Film Festival in October 1996. The anticipation of Universal's re-release—of a motion picture that has been widely available to television, revival houses and home video since its re-issue in 1983—was due to the fact that it was to be fully restored by Robert A. Harris and James C. Katz, the noted film doctors responsible for saving and restoring such classics as Spartacus, Lawrence of Arabia and My Fair Lady. 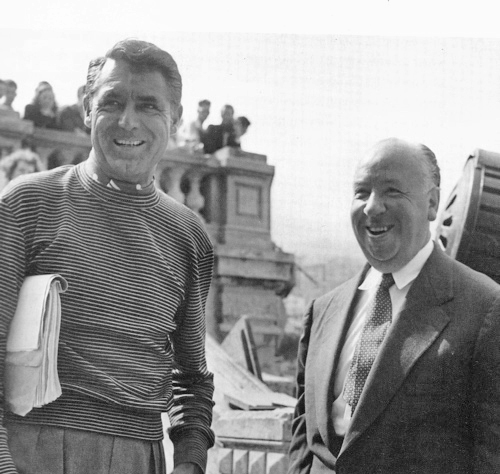 Vertigo was a very different slice of cake from the previous films Alfred Hitchcock made with James Stewart and Paramount Pictures. The difference was in the film's tone, and its lack of a "Hollywood" ending. In the 1950s, audiences had come to expect a high level of excitement, wit, and sophistication from a Hitchcock movie. 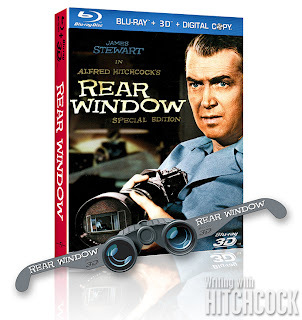 Rear Window, To Catch a Thief and The Man Who Knew Too Much, all scripted by John Michael Hayes (who also wrote the director's The Trouble with Harry), had conditioned audiences to light comic thrillers, each presented in widescreen and Technicolor (the latter three in VistaVision, Paramount's widescreen process which produced a larger and sharper negative by running the 35mm film horizontally through the camera rather than vertically). The director's first production after his four-film collaboration with Hayes was The Wrong Man, made for Warner Brothers in black and white, with a dark and gloomy script based on actual events. The picture failed at the box-office. When Hitchcock returned to Paramount to make Vertigo, advance publicity boasted a return to Technicolor and VistaVision, and a tried-and-true Hitchcock star, James Stewart. How could they go wrong? 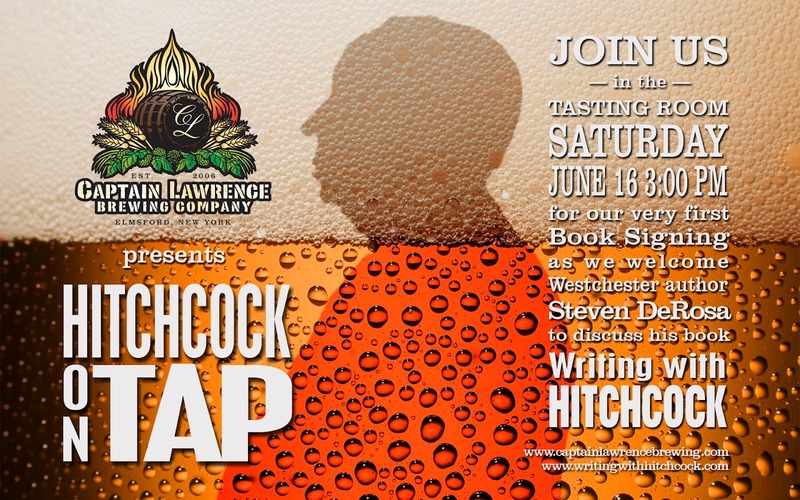 What Hitchcock and the studio had not reckoned, was that his lighter features and enormously popular television series, Alfred Hitchcock Presents, left audiences unprepared for the emotional realism and deeply personal statement Hitchcock made in Vertigo. The combined talents which came together on Vertigo include stellar performances from the film's stars James Stewart and Kim Novak, a sensitive and moving score by Bernard Herrmann, and the subtle lighting and exquisite camera movement of Hitchcock's cinematographer, Robert Burks. Also noteworthy are Edith Head's costumes, Henry Bumstead's production design, George Tomasini's magnificent editing, and one of the most honest, revealing and mature scripts Hitchcock ever worked with, written by Alec Coppel and Samuel Taylor. In a sense, Vertigo has been undergoing a "restoration" since the end of its first theatrical run. Not a restoration to a deteriorating negative, but of the high regard that even Hitchcock had for the film. The original ads for Vertigo, designed by Saul Bass and approved by Hitchcock, were rather vague, yet boldly included the words "Alfred Hitchcock's Masterpiece." After the picture failed to meet its commercial expectations, the studio publicity department replaced the Saul Bass ads with more of a "hard sell" approach. The following week, the box-office receipts had again risen, but faltered not long after. Vertigo made a small profit, but Hitchcock was always disappointed that the film he chose to sell as his "masterpiece" was not embraced by audiences. Today, Vertigo makes its perennial appearance on various top ten lists; was among the first twenty-five films chosen for the National Film Registry in America in 1989; and has had its second major reissue since the director's death in 1980 - not bad for a picture that was largely dismissed nearly forty years ago. 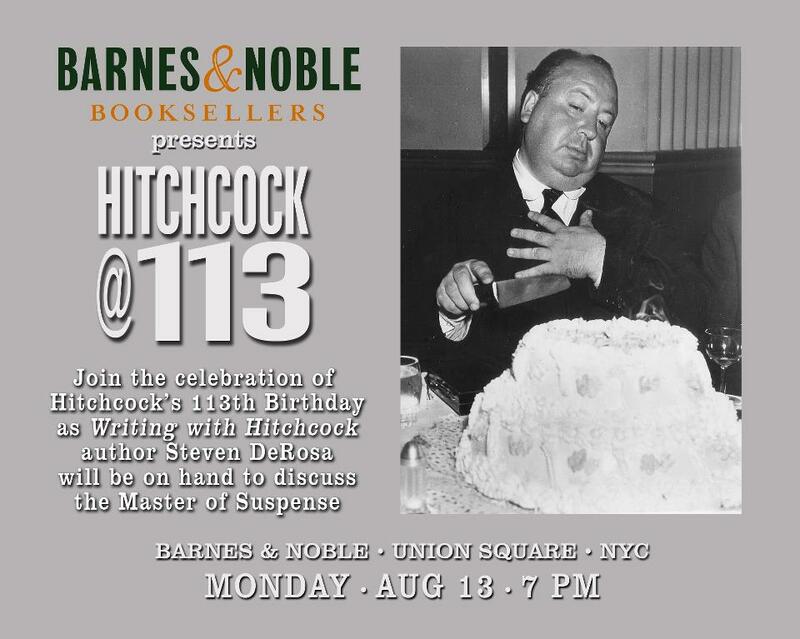 That, of course, is a testament of Alfred Hitchcock's genius as an artist, entertainer and pop-culture icon. Vertigo's reputation has improved with age. The ad promoting the restoration and new 70mm presentation is the original Saul Bass design which Hitchcock approved. The physical restoration of the VistaVision negative, and the restoration of the film's prominence in cinema history would appear, at last, to have been complete. Robert Harris and James Katz are to be commended for their painstaking effort. However, after looking forward to the presentation of the “restored” print for sometime, I am saddened to say that the effort was disappointing. The presentation at the Ziegfeld opened with a filmed introduction by Martin Scorsese, who went on to extol the virtues of Vertigo, the genius of Alfred Hitchcock and the importance and urgency of film preservation and restoration. Scorsese has long been a champion of film preservation and has been responsible for much interest in the rediscovery of both underrated classics as well as highly regarded films such as Vertigo. In the restored print following the Universal logo, the original Paramount Release and VistaVision logos have been restored to the film—both had been absent from the prints and videos of the film since Universal released the picture in 1983. The main title sequence, designed by Saul Bass and accompanied by Bernard Herrmann's brilliant score, was in excellent condition. There was only one noticeably torn frame in the print, during the scene where Scottie asks Judy to change the color of her hair. And except for the flashback sequence where Judy (Kim Novak) recalls her climb to the tower where Gavin Elster (Tom Helmore) waits with the body of his wife, the negative seems to be in fine shape. That sequence in the “restored” version (as it does in the 1983 prints and video release—albeit less so) stood out from the rest of the picture for its graininess. The timing of the print in New York was also uneven. In particular, the finale, where Scottie brings Judy back to the scene of the crime, was printed much too dark. It is one of the greatest sequences in the Hitchcock canon and much of its impact was lost due to the fact that the actors were difficult to see. The timing of the Los Angeles print was much better. Visually, the 70mm print is stunning. Where the “restored” version fails however, is in the new sound mix. The texture, tone, and level of many of the film's sound effects and in some instances, dialogue passages, have been degraded for the sake of utilizing a digitized recording of Bernard Herrmann's original score. 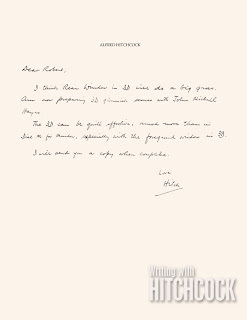 Employing foley artists to create whole new sound effects tracks, the restorers claim in the press kit for the release to have utilized the pages and pages of Hitchcock's personal sound notes, however Harris and Katz have rather boldly second guessed Alfred Hitchcock (and an Academy Award Nominated sound crew). Instead of trying to recreate the sound effects as closely as possible to the original film, the “restoration” uses additional sound effects which were never there to begin with, and in a few instances sound effects have been omitted. These differences may seem minor to the casual viewer. However, to someone familiar with the film, from the very first gun shot of the opening sequence to the ringing of the tower bell in the finale, the differences are jarringly apparent. These variations from the original work go beyond the scope of what a restoration should be. The level of each newly created footstep, the rustling of papers, and the automobile sounds appeared too hot throughout the picture. Perhaps I am being too critical of the mix, feeling that the sound effects were not at all subtle—almost as if the foley artists wanted to call attention to their work—but one cannot be too critical of the creation of effects that were never there before, especially since the restorers had the original film to guide them. At a single viewing of the “restored” Vertigo, I noted the following major differences—during the scene where Madeleine jumps into San Francisco Bay, the original picture does not contain sounds of seagulls, however the 'restoration' does. The day after Scottie saved Madeleine from the bay, he follows her in his car as she drives back to his house. At one moment a car can be seen pulling into the street on the right side of the frame. In the original film, the sound of a car horn accompanies this point of view shot, and is absent in the “restoration.” Later in the same sequence, Scottie makes a gesture to engage the hand-brake as he parks his car, and the accompanying sound effect is no longer there. At the end of the nightmare sequence, Herrmann's cue on original track fades out as the scene dissolves from the closeup of Scottie to an exterior shot of the sanitarium. The “restored” mix left in an additional odd musical note over the latter shot, which clearly had been faded out in the original mix. Later, when Scottie returns Judy to the Empire Hotel following their first date, the original picture does NOT have the sound of the parking brake, and the "restored" version DOES. In the scene in Ransohoff's, where Scottie gives a saleswoman specific instructions as to the clothes he wishes to buy for Judy, the "restoration" now includes the familiar chime of department store elevators, whereas the original soundtrack does not. When Scottie is waiting for Judy to return from the beauty salon, he stands in the doorway to hotel room, and in the original picture there is the sound of the elevator door sliding open and then Judy appears. In the “restored” version, the sliding elevator door is replaced with a bell sounding the arrival of the elevator. Finally, as Scottie and Judy arrive at San Juan Batista for the finale, a rather loud ambient effect of crickets is now on the track where it hadn't been before. So much for an Academy Award Nominated sound track. The issue has been debated and the restorers have defended their work on various internet discussion lists, where they claimed "the new sound was based upon the original mono mix which is heard on the 35mm optical 1958 prints AND... the magnetic combined m&e (music and effects track)..." which "contains more information than the optical track." It would seem that the new sound should only have been "based upon" the original track of the 1958 prints—after all, was that not the version that was among the first twenty-five films selected for the National Film Registry in 1989? Audiences in 1958 got to see Vertigo printed in IB Technicolor. The color process in which colored dyes—yellow, cyan and magenta—are actually placed on the film. The beauty of true Technicolor is obvious to anyone fortunate enough to see a screening of an archival print in a revival house or museum. During their Hitchcock retrospective last spring, the American Museum of the Moving Image in Astoria, screened an original 35mm IB Technicolor print of Vertigo. The print, while suffering some signs of its age (1958), was quite beautiful to see. There were colors and subtleties that I had never seen before in any of the 1983 release prints. Harris and Katz went to great pains to locate original costumes and paint chips from antique cars in order the match the look intended by the original filmmakers. The purpose of this seems more a means of showing off. IB Technicolor prints of Vertigo are in existence. These original prints would have served as the best guide to match the colors and sound. The green dress worn by Kim Novak does look a certain way in reality, but that is not necessarily the shade of green that it might appear in Technicolor. All the restorers really needed to do was look at the original film as printed in Technicolor, and sequence by sequence, scene by scene, they had same palette from which Hitchcock created the look of Vertigo. Aside from some printing problems, which were corrected in the print I saw in Los Angeles, the restorers have done an admirable job pictorially. 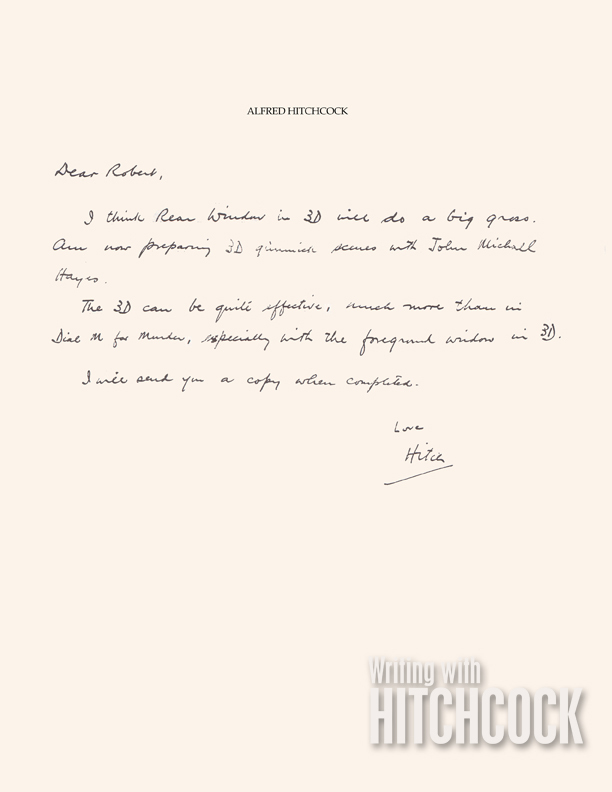 James Katz was also quoted in the September/October Films in Review as stating that subsequent 35mm prints may be printed in IB Technicolor. Imagine new 35mm IB-Technicolor prints of Vertigo with the original sound track—now that would truly be a restoration. 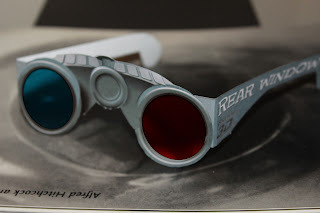 A few years after the "restoration" I spoke at a screening of Rear Window held at the Museum of the Moving Image. That film had also been restored by Harris and Katz, who by this time had the good sense not to tamper with the soundtrack. So with that said, get yourselves to the Museum of the Moving Image this weekend as Vertigo will be screened in its original glory and beauty on Saturday and Sunday at 6:00 PM. 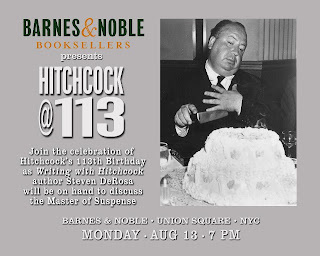 And if you're able to make it to the screening in Astoria, I hope you will come and join me as I mark Hitchcock's 113th at Barnes & Noble in Union Square on August 13 @ 7:00 PM.